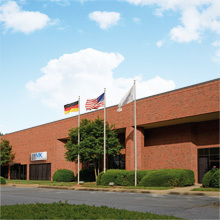 Our plant in Duncan, South Carolina, USA, has been rolling and prefabricating high quality precision strips, foils, and superfoils for the American market since early 2009. With one of the most modern 20-roll mills in the USA, this plant is setting standards in guaranteed production within the tightest of tolerances. The site is a fully integrated plant for rolling, annealing, stretch bending, and longitudinal slitting and can execute all operations from the raw materials to the end product.